If gaming isn't your style, enjoy the sports bar. Located in the famous FUN Street of Niagara Falls, on Clifton Hill, the 40,000 sq. 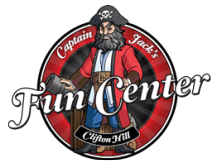 ft. Captain Jack's has a hill of fun in its store. Now get ready for it! You can also plan an event in Captain Jack's Pirate Cove! Whether it is your birthday, friendly get together, corporate or holiday party. Captain Jack's Pirate Cove host events with so much of fun, the way everyone likes with private rooms are apt for business meetings and team-building activities.